← WIWT: Potato Chips & Soup! Y.A.P. Time! 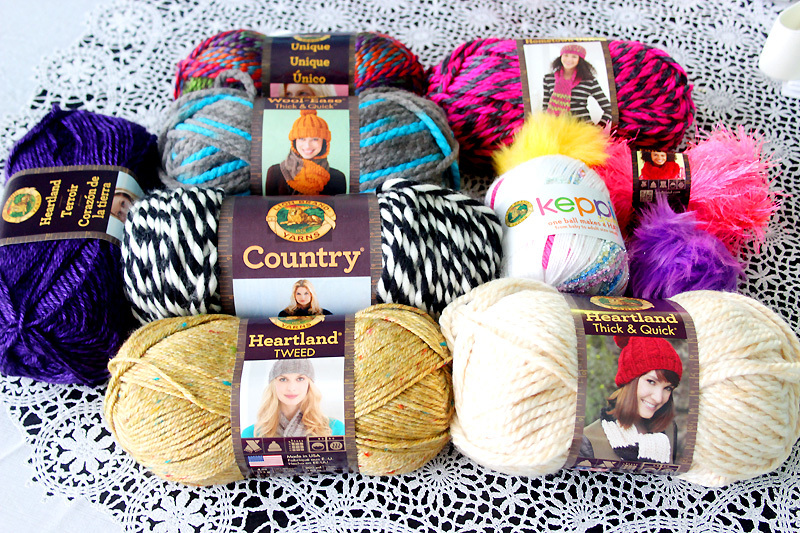 New goodies from Lion Brand Yarn! Soooo we haven’t had a Y.A.P. Time (Yarn Appreciation Post) in, like, forever. I only ever made ONE. I’ll try not to go so long again! This Y.A.P. is brought to you today by our friends at Lion Brand Yarn, who so very generously sent me a beautiful box of new goodies! I have definitely wanted some time to play with Keppi ever since it came out. 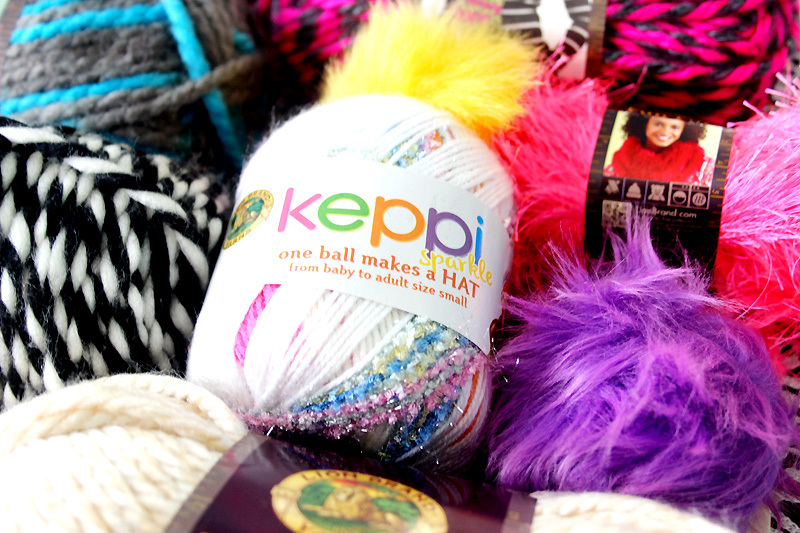 The color range is delicious and fun, and all the balls come with a pompom!! It’s been pretty hot this week, so the idea of playing with bulky yarns is kind of icky, but there are some new yarns and colorways in this package that are pretty irresistible if you want to start planning for Fall. My eye goes straight to the black and white skein of Country, which I’m not really familiar with, but I love how big and squishy it is! I vote we campaign for some pastel and candy colors for Country! Unique is another line I’ve never played with before, but is nice and chunky and comes in a range of painterly tweeds. There are a lot of yarns made by our favorite brands that sometimes don’t make it to the big box stores, so if you are a yarn-lover, you should definitely check out yarn company websites, because they have a TON of yarn, and you can often purchase the yarn online! Wool-Ease Thick n Quick is definitely a favorite among a lot of Etsy sellers, and it looks like LB will be releasing some new colorways, like the grey and blue one pictured above. The written label says “Blue Jay 514,” which is not available on the LB site, yet, so we should all look out for some pretty new colorways for Thick n Quick! Have you ever worked with Hometown USA? It’s a bulky yarn that comes in a surprisingly wide range of colors now. In fact, I was a bit surprised at the range just now when I took a peek to find the link. Is it chunky enough to crochet an ottoman with!?? Maybe I’ll find out! In my photo, Hometown USA is the one with the hot pink and grey. I’m not sure which one of these I’ll use first, but I’ll be sure to keep you posted on any projects! This entry was posted in Blog and tagged yarn. Bookmark the permalink. 4 Responses to Y.A.P. Time! 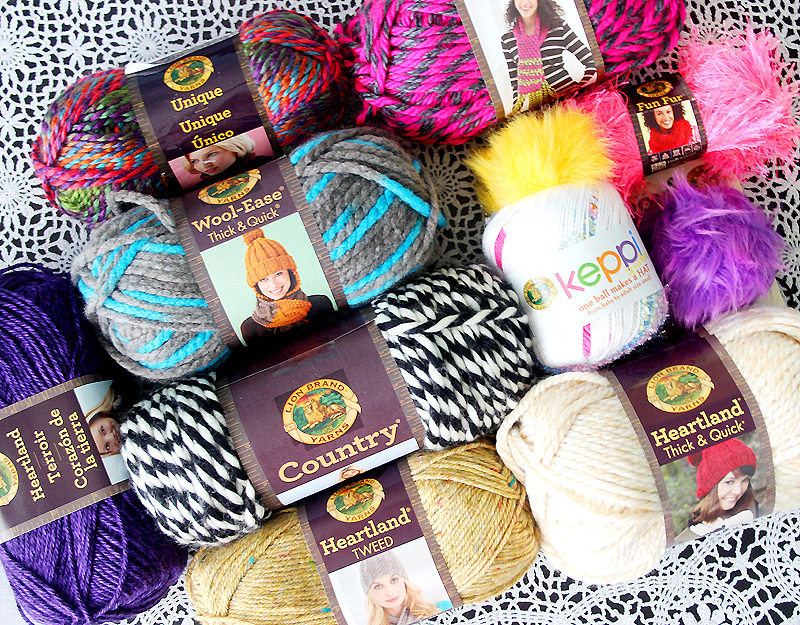 New goodies from Lion Brand Yarn! WOW! Those are gorgeous! I want them all! Can’t wait until they’re available to get my hands on. Especially the keppi and the new wool-ease. That does it…I’ve been ogling the Keppi…now I have to pick some up and try it! LOVE THEM!!! Can’t wait to get some of those colors!!! I love the black and white as well! I used the hometown for that chunky cowl i did this pat winter and for my Mr T necklace I did last month – it is SO soft and yummy!!! I can’t to see the goodies you make!